Ibn Rushd was born in Cordoba Spain in 1126, and died in 1198. Ibn Rushd, known in the Latin west as Averroes, was a devout Muslim, focused on combining both philosophy and various observations with the words found in the Quran. He believed that the seemingly conflicting ideas between these two realms were only surface level and that they could be united. He thought that the Quran had many parallels to philosophy and because of this, philosophy should be used as a form of truth as well. His thoughts on this subject, and the building of a bridge between these two areas, continued with many other Muslim philosophers and led to further studies, while also keeping controversy with these ideas at a minimum. He went so far as to apologize in one of his public works for those who believed that philosophers did not have religious beliefs. Averroes statue, Córdoba. Photo by Chris Juden. He was somewhat controversial in his time, despite efforts to minimize contention. He disagreed with Ptolemy and some of his ideas on his own philosophical grounds, which revolved around concentric spheres. Aristotle believed that heavenly bodies forever moved because they had an affinity and desire to please God. 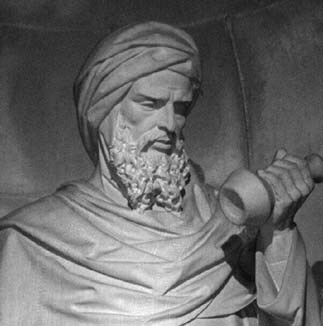 Ibn Rushd believed though, in contrast, that those who moved the spheres were beings based in intellect and that the heavens embodied life and reason; this led to their motion being because of their own ideas or notions. A simpler way of stating this principal is that since being in motion implies that an object is living, it can be inferred by their constant motion that celestial bodies are living. He was also heavily involved in philosophical thinking on subjects from law to medicine. He managed to write a medical encyclopedia, as well as had many discussions and commentaries on political affairs like land taxes. 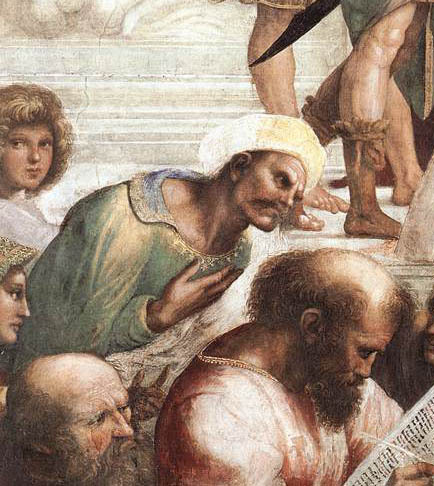 Averroes from Raphael’s “School of Athens.” Wikimedia Commons. Eventually, due to his ideas, Ibn Rushd was exiled due to political reforms against more liberal ideals. He was sent to Lucena and his writings and books were destroyed as well as banned. Though he was eventually able to return to Cordoba, he died a year later. His ideas did eventually make a resurgence in many different realms following his death. Overall, he seems to have made many contributions in philosophy and astronomy, and set precedents that would be followed after his death, and ideas that would later be reexamined. Hillier, Chad. Ibn Rushd (Averroes) (1126—1198). Web. Internet Encyclopedia of Philosophy. Hockey, Thomas, et al. Ibn Rushd: Abū al‐Walīd Muḥammad ibn Aḥmad ibn Muḥammad ibn Rushd al‐Ḥafīd. New York: The Biographical Encyclopedia of Astronomers, 2007. Husik, Isaac. Averroes on the Metaphysics of Aristotle. Durham, North Carolina: The Philosophical Review, 1909. Scribner, Charles. Ibn Rushd, Abū’L-Walīd Muḥammad Ibn Ahmad Ibn Muḥammad. Detroit, MA: Complete Dictionary of Scientific Biography, 2008.